Several readers who comment regularly have told me that their comments didn’t appear. I found the comments in the “spam” file, and have no idea why they went there. I restored the ones I found that weren’t real spam. If you’ve made a comment and haven’t seen it, email me with your posting name and the email address you use in the comment field, and I will try to recover your comment. This assumes, of course, that you haven’t been banned, but I believe that if you are, your comments simply won’t go through, and won’t look as if they’ve been posted. WordPress has been messing around with the format and practices lately, and, as usual, I have to go along with what they do. I may upgrade soon, which might fix some of these issues, though not the big one that readers aren’t able to edit their comments after they’re posted. Do proofread before you press that button. This entry was written by whyevolutionistrue and posted on May 22, 2018 at 7:30 am and filed under Uncategorized. Bookmark the permalink. Follow any comments here with the RSS feed for this post. Both comments and trackbacks are currently closed. This looks like a good post for this question. For some unknown reason, I frequently get the wrong image in a post when looking at the regular WEIT page, but once I open just that story, the correct one appears. For instance, currently if I scroll down to the David Goodall post, the image is Jackson (not sure which one) and Scream. Viewing thru Firefox. This happens to me as well. I’m not sure there’s anything that can be done. I happens with some other blogs as well. Thx, didn’t think it was just me, but good to have that confirmed. never left comments before. If it gives some positive feedack to you for your time writting then will do so more often. I like the this day in history, I daily look at wiki headline page and enjoy the this day, your summaries are cool. as Alb born NMSU grad, loved seeing the trip to NM. thanks ! I alwasy profreeed before psoting. If you do upgrade, any chance of adding a “like” button? Sometimes I am just in too much of a hurry to write a comment, but someone else has already said pretty much the same thing, and it would be nice to be able to just hit a “like” on their comment. And oh yes, consider this a “like” on mkgjones. Not sure how you view WEIT but when viewing the site directly via Chrome browser I can “like” comments that people write in response to a comment of mine by clicking on the bell icon up in the top left hand corner. That drops down a menu that lists all responses to comments you have made and all “likes” you’ve received from others. Directly from that menu you can respond to, or “like” comments. I think you have to have a basic WordPress account for that feature, but I’m not sure. …I can “like” comments that people write in response to a comment of mine by clicking on the bell icon up in the top left hand corner. Oops, yes indeed. My other left. 🙂 Exactly! I think I’m just too logical. I thought there was a like button already; at least I get a notice sometimes that a reader has liked a comment. I’ll check on that. I also occasionally get “likes” from other readers for my comments on your web site, but when I view the page (in Safari) I don’t see any like button with which to reciprocate. Click on the Bell Icon very top & right of your WEIT page – it’s to the right of your avatar in the black horizontal strip top of page. I see none of that. Because I don’t have a WP account? What good does it do them to have so many people setting up sham blogs? Yeah all those sham blogs are really annoying! I’ve managed to not have an empty, useless wordpress.com site by checking the box opting out of a blog when I signed up for my wordpress.com account. [the option to opt out is not visible if one happens to be signed into a wordpress.com account at the time!]. It’s been a long while but I suppose the opt out option still exists. What Twitter credentials? 😉 I don’t do social media. I can get by w/o a like button as long as I can plus-one. As always, thanks for the info, Michael! It took me a google search to find the page just for registering. Are you also “Diane G”? Yeah, that’s how I thought it went/appeared. Why not just offer the option up front? Oh, and thanks as always for the sleuthing! It has been so long that I can’t remember the details of how I registered with WordPress, but I didn’t have to set up a blog to register nor was a blog automatically created as a result of the registration process. I don’t remember having to select to op out of a blog as Michael Fisher describes, but like I said I don’t remember the details very well. Okay, just poked around my settings on my WordPress.com account. 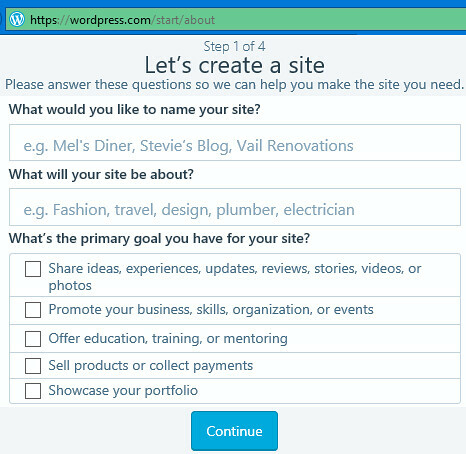 Apparently I can create a WordPress website (blog), or more than one, by simply going to my Account Settings page and clicking on the “Add New Site” button, which then takes you step by step to set up a site / blog. But no website was created automatically as a result of my registering. Thanks. That so many name hotlinks here go to a “blog” in name only, I was under the impression that one might be required to do so. Yes, I know about that, but there is no way to “like” posts. Yesterday I downloaded the WordPress app for Mac and it does have the like buttons, but I don’t suppose I’ll ever use it in preference to a browser. I looked at WordPress.com forums & it’s clear from there that you should be able to like comments in Safari if you’re logged into your WP account & not in Private Browsing mode. At least WordPress doesn’t do weird text correction like cellphones. The other day I sent a text message to a friend and it changed “Pete Seeger” to “Pete See Her”. Folks, click on the ‘Reader’ icon at the top left (in the WordPress bar). It opens a different view in which the like button appears below each comment. Please like this comment.